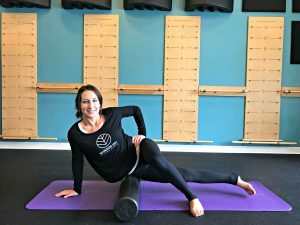 This foam rolling series teaches you how to hydrate the fascia and connective tissues surrounding your muscles. This will increase the blood flow to your muscles as well as create better mobility, helping with recovery and improving performance. For long term benefits, you will need to find the most sensitive area of each muscle group, repeat on both sides and hold for 30-60 seconds. Place the ball of your left foot on the roller six inches in front of your standing foot while balancing on your right foot. Inhale as you press your foot into the roller, moving the roller from your arch to the front of your heel. Apply as much pressure as you can. Exhale and roll back to your starting position. Calves – This is broken down into two parts, complete one before moving on to the next. Place the foam roller underneath your right ankle and cross your left leg over. Place your hands slightly behind your shoulders for support and lift your hips. Part 1. Inhale as you roll from your ankle to the lower portion of your calf. Exhale as you roll down to the back of your ankle. Part 2. Inhale as you roll the entire lower leg from your ankle to your knee. Exhale as you roll down from your knee to your ankle. Place the area right above the bony part of your hip and below your pelvis on the roller, this is the tensor fasciae latae (TFL). Cross your left leg over your right, grounding down on your left foot. Inhale and exhale long and smooth as you use your left foot to create motion and roll up and down this area. Internally rotate your foot and knee to roll the outside of your TFL. Externally rotate your feet and knees to roll the inside of your TFL. Come down on your forearms with the roller placed perpendicular under your right hip. (You may also bend your right knee so your heel is facing the ceiling). Place your left knee and thigh parallel to the roller. Twist your body slightly to the left to expose your psoas, and roll up and down the attachment of the your hip and psoas, keeping your breath smooth as you move. (Note that this is a very small and slow movement – you’ll be rolling no more than two inches). Quads – This is broken down into four parts, complete one before moving on to the next. Come down on your forearms with the roller placed perpendicular under your left hip. (You may also bend your right knee so your heel is facing the ceiling). Place your right knee and thigh parallel to the roller. Part 1. Inhale as you roll from the top of your leg to the middle of your quad. Exhale as you roll back to the top. Part 2. Start by crossing your right leg over the left with the roller under your mid-quad. Inhale as you roll down towards your knee. Exhale as you roll up to just your mid-quad. Part 3. Place your right knee and thigh parallel to the roller (first position) and externally rotate your left foot so the inside of your foot is facing the ground. Roll up and down the length of this muscle breathing with each movement. Part 4. Start by crossing your right leg over your left. Slightly internally rotate your left leg so the outer part of your leg is on the roller. Roll up and down the length of this muscle breathing with each movement. 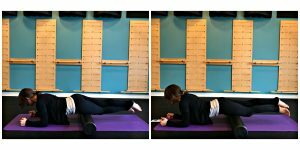 Come down on your forearms and place the roller lengthwise under your left upper inner thigh. To do this, bend your left knee up and out to the side and place the roller up and under your groin. Taking care to keep your upper body square to the floor as you move, use your forarms and right leg to control the movement as you roll the roller down toward the knee (stopping just above it) and back up again. Sit on the roller with your knees bent and place your right hand behind you. Cross your right ankle over your left knee to form a figure four. Shift your weight slightly to the right hip/glute area and roll back and forth a few inches in each direction. Place the roller under your sacrum (the triangular bone at the base of your spine). Place your upper back and shoulders on the mat, keeping your waist elevated in a bridge position. Lift your legs to a 90-degree angle and place your hands on either side of the outer edge of the roller for stability. Inhale as you begin lowering your legs down to the right side as low as you can without sensation or arching in your lower back and/or shoulders. As you exhale, use your transverse abdominals to draw your legs back up toward the ceiling. Your spine should remain stable and neutral for the duration of the exercise. We promise, you’ll feel better when you’re done. Don’t forget to breathe, and enjoy these deep recovery exercises!